It is often thought that memory is the key to advanced language and that most non-human species do not have it. It is in this way we speak about the goldfish. But just as the goldfish, most animals have much better memory than humans and thus a better capacity for advanced language. One telling example is the grey bamboo shark. 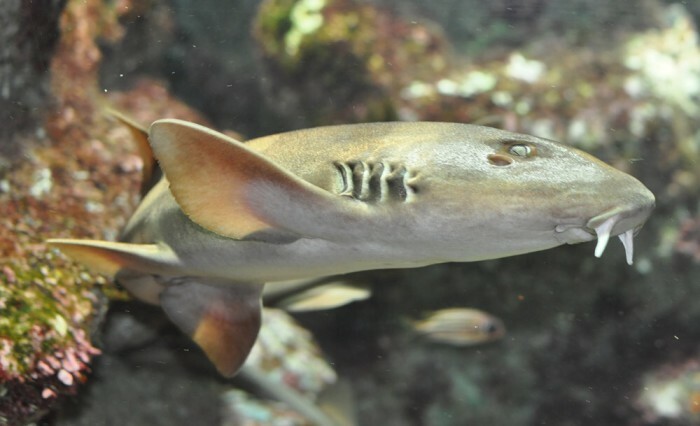 Dr Vera Schluessel at Rheinische Friedrich-Wilhelms-University in Bonn, Germany has been researching the language of the grey bamboo shark (Chiloscyllium griseum), a carpet shark that dwells in the Indo-West Pacific and reaches lengths of just over 2 ft (0.6 m). Last year, Schluessel’s PhD student Theodora Fuss subjected juvenile sharks to three different language experiments, one at a time, and then tested to see how long the sharks could remember their training. The results are published in the journal Animal Cognition. First, Theodora showed that she could train sharks to recognise and remember shapes. She placed the sharks in a special holding tank, and projected an image onto one of its walls. Four sharks were taught to always choose a triangle, and received a small piece of food for pressing their nose on the triangle. The other four sharks were taught to always recognise a square, and were similarly rewarded. The mind is tricked into seeing a square and triangle shape in shapes (a square and triangle). Theodora then tested whether the sharks could transfer their ability to recognise the appropriate shape. The sharks were shown Kanizsa figures, a type of illusory diagram used to trick humans into “seeing” a certain shape. By aligning Pacmen-shaped figures in the right orientation, humans get the impression of a shape, “seeing” the edges of a shape when there aren’t actually any edges. Just like most humans, the sharks took the bait. Significantly more often than not, the sharks correctly chose the images with Pacmen properly aligned over figures with randomly rotated Pacmen. Sharks now join the ranks of several other animals that can perceive optical illusions, including cats, monkeys, owls, chickens, and goldfish. In sharks, the ability to fill in information from incomplete visual cues most likely translates to abilities that increase their chances of survival in the wild. These abilities might include recognising prey hiding in sand, or quickly finding a shelter to escape from a larger predator. After the first set of experiments were complete, Theodora tested whether the sharks could learn to choose a hollow-square shape from a background of diagonal lines, and distinguish the square from a rhomboid on a similar background. The sharks learned that trick easily, requiring less training time than in the previous experiment. The third experiment was perhaps the most impressive. A Müller-Lyer illusion. First, Theodora presented the sharks with lines of different lengths, and taught the sharks to always choose the longer line. Once the sharks had mastered that, Theodora tested whether the sharks could transfer that skill to another type of optical illusion, called a Müller-Lyer illusion. The illusion consists of a series of arrow-like figures. By placing ‘fins’ on the ends of ‘shafts’ of equal length, humans are easily tricked into thinking a line is longer than it really is when the ‘fins’ face away from the end of the shaft. The sharks were not fooled in the slightest. They were almost always able to tell the lines were the same length, despite the misleading ‘fins’ on the arrows. By the time the third experiment was done, many weeks had passed. Theodora tested the sharks to see if they still remembered their training from the first experiment. Up to 50 weeks later, almost all the sharks still remembered which shape to select. A year is a lot longer than many other animals’ ability to remember training. It’s a long time not only for fish, but places gray bamboo sharks in fierce competition with birds such as crows, and even primates, such as humans. Not all the individual sharks could remember their training a year later, however. During the training sessions, some sharks were faster to learn their tricks than others, too. Just like with traits such as size, shape, or colour, individuals vary in their ability to learn and retain memories. Sharks may find it hard to forget. Sharks may find it hard to forget. The sharks will remember their lessons for even longer than 50 weeks, but Theodora ended the study, to begin investigating which part of the shark brain is responsible for such feats of memory. Unlike with mammals, it is currently completely unknown how and where in the brain sharks process, store, and retrieve memories. The grey bamboo shark is a benthic feeder, swimming along the ocean floor, scooping up sand with its mouth and hoping to catch small fish, worms, shrimps, mollusks and crabs. This shark species was a much better visual learner than expected, but species that are visual hunters rely much more heavily on their sight than benthic feeders. That means visual hunters such the Great white shark (Carcharodon carcharias) might be capable of even greater mental feats. ‘Jaws’, it seems, might also have brains. This entry was tagged fish, memory, ocean, reseaech, scuence, shark, training.